We will be taking a look at both recreational and professional volleyball systems. In most cases, you’ll want a portable volleyball net system that can be put up and taken down quickly. These can be used on the lawn, in your backyard or at the beach. It’s also nice to be able to fit them in your trunk for those moments when everyone want to play some volleyball. Most volleyball sets focus on the net and poles and don’t come with the greatest volleyballs. For the best indoor and outdoor volleyballs, take a look here. For the complete volleyball net systems, take a look below. 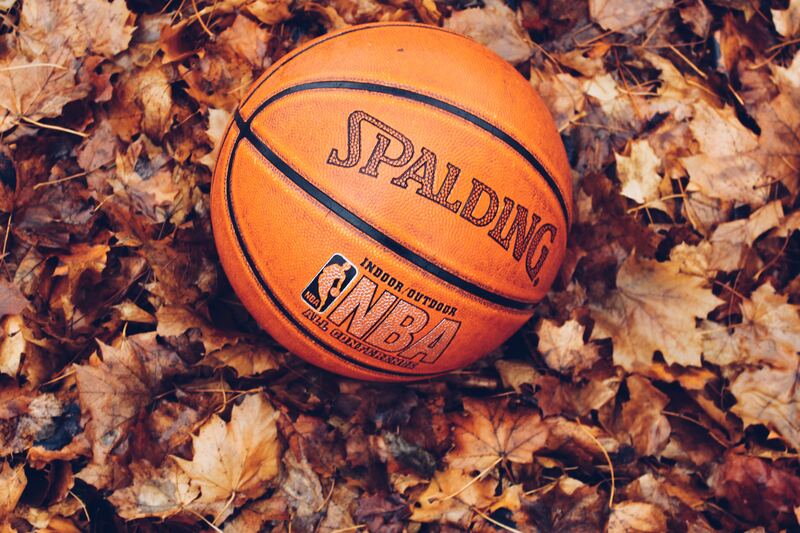 Nets — Are the most important piece of equipment you’ll be buying. In most case, you’ll want to stick with a regulation size volleyball net. You want to be able to set the net to 3 different playing heights: 8′, 7’4″ and 7’8″ for men, women and co-ed games. The net material should also be made from a highly durable nylon. Poles (standards) — In volleyball terms, poles are called standards. These keep the net in place and keep it tight and taut to be able to withstand abuse. Poles that are too thin or too light may be unstable for aggressive play. You don’t want your poles to be bending and breaking from the wind or competitive players. But you also don’t want to spend too much on a system that won’t see that much usage. Thickness and the construction quality of the poles is very important and often reflected in the budget. Durability — Your volleyball set and poles should be constructed of thick, durable and waterproof materials to last years of regular play. We recommend aircraft aluminum telescoping poles with at least a 1.5″ diameter to ensure a sturdy volleyball net. You, don’t want a disposable net system that you’ll have to replace the next summer, so try to avoid plastic, treated wood, or thin metal. 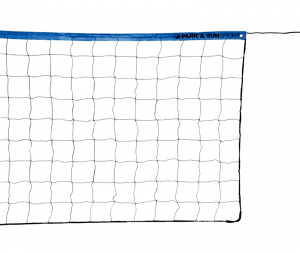 Portability — Volleyball net systems need to be easy to unpack, set up and take down. You don’t want to spend hours setting up your net system while everyone is waiting around. We prefer telescoping poles for outdoor systems and roll/fold away systems for indoor volleyball nets. Weight is also important. It is worth the investment to buy a high quality net that is also durable and light enough to be portable. The best quality brand with the biggest range of volleyball net systems is Park & Sun Sports by far. They offer a huge collection of volleyball kits that suit different requirements and below we compare the different series that they offer. It is worth it to spend a bit of money on a good volleyball set that will last years and . However if your budget is very small, we can suggest the Franklin Classic Volleyball Set. It comes with everything you need to get a game going in a matter of minutes and comes in at a very low cost. It is cheaply made and very basic but if you can find a way to stabilize the poles and base so it doesn’t get knocked over easily, then this is a decent set. We would strongly suggest spending a bit more so you have a volleyball net that won’t fall apart. That being said, the best volleyball set for most people is the Baden Champions Series Volleyball Set. 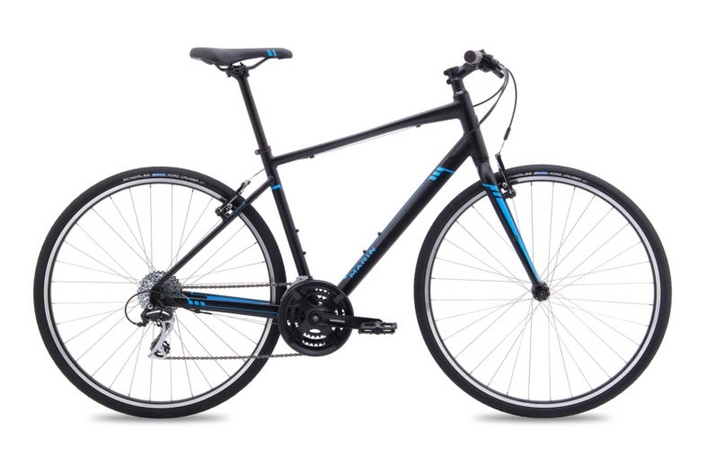 It offers a good balance between quality and durability and price. 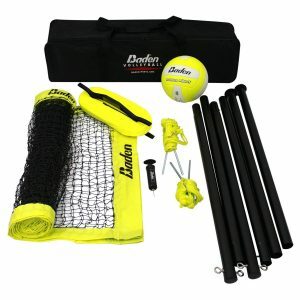 It includes a Baden premium quality volleyball, ball pump with needle, 2 heavy duty adjustable steel poles, regulation-size nylon mesh net with waterproof tapes, set of weatherproof boundary lines, and a durable nylon carry bag. 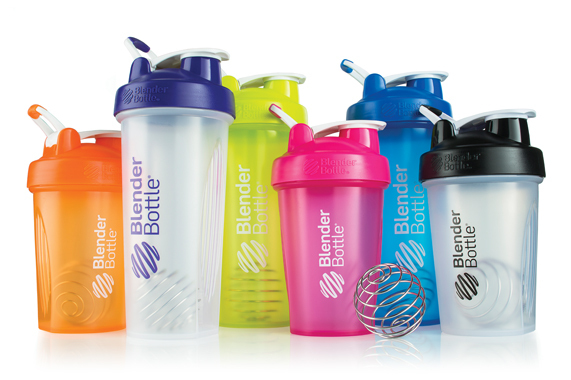 It has a frustration-free design and can be set up within 10-15 minutes from opening the box. The construction of the plastic and metal are solid without any flexing, so the net stays taut and doesn’t ever droop. The volleyball that is provided is also soft touch so it won’t hurt or sting when you hit it. Everything feels well-constructed and fits together quickly and easily. For the price it offers excellent quality and you won’t have to deal with the small problems that come with cheaper volleyball sets. Park and Sun Sports offers a wide range of volleyball sets, from family friendly and portable to professional and permanent installations. We found it better to offer a comparison of the different series that they offer so that you can decide what you need and what you’re willing to pay. The first series they offer is the Sport Series that is designed for families. 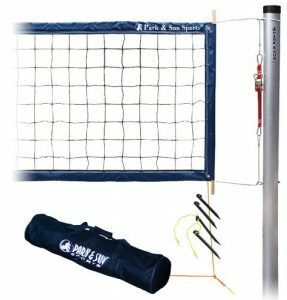 The best volleyball kit in the Sport Series is the Park & Sun Spiker Sport Steel Volleyball Net System. It is significantly less expensive than Park & Sun’s other net systems and comes with everything that most families need. It is great for setting up at the park or in the backyard and the steel 3-piece poles allow you to adjust the playing height to 8′, 7′ 8″ and 7′ 4″. 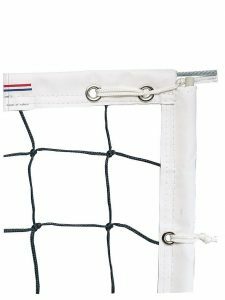 The net is a regulation size Momentum net that has a nylon blend and 1.5″ taped top and side straps to attach to the poles. 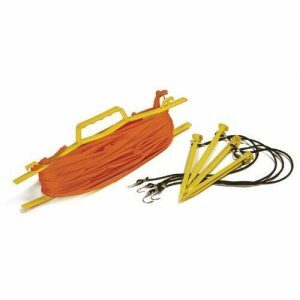 There is a 3/16″ double guyline with tension rings to keep the net tight through rough play, and 8″ zinc plated steel stakes to keep everything stable. The volleyball isn’t the greatest but it will do for most situations. The stakes are also ABS plastic and not steel. 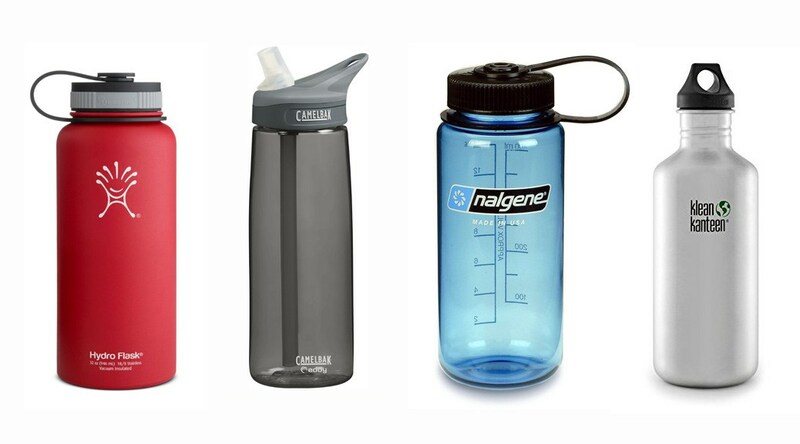 This set also comes with a compact hand pump and a heavy-duty polyester zippered bag to make transporting and storing more convenient. Overall a great option for any family outing. The Pro Series is more than double the price of the Sport series but it offers better construction and stronger materials and durability. But they do not come with their own volleyballs. 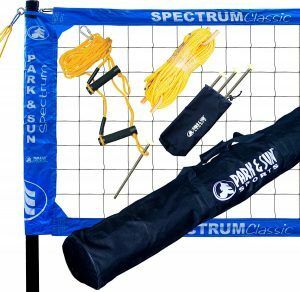 The most popular in the Pro Series is the Park & Sun Sports Spectrum Classic: Portable Professional Outdoor Volleyball Net System. It is one of the most lightweight and popular volleyball net systems on the market and is often ranked as the top seller. But there a couple of differences to keep in mind compared to other net systems. The top tape line is a nylon rope and not a steel wire that is preferable to prevent the net from flopping over. There are also no adjustment lines on the sides so the poles go right through the net itself. We also don’t recommend using the telescopic feature at the beach, because if you collapse them with sand on them it can get stuck. But if you can deal with these issues, we highly recommend this volleyball net system for its overall quality, lightweight design and portability. Another net in the Pro Series is the Park & Sun Sports Spectrum 2000 Volleyball System. It is extremely similar to the Spectrum Classic above with slightly different metrics. The prices in the Tournament Series cost a bit less than the Pro Series. 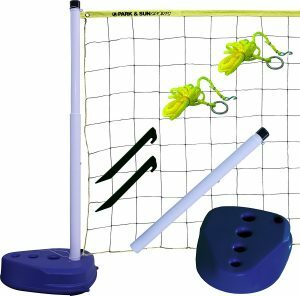 The Park & Sun Tournament Flex 1000 Volleyball Net System is another great volleyball kit and highly durable. It has many of the same features of the Pro Series but it also includes the Park & Sun Soft Touch volleyball. 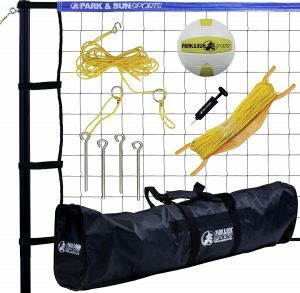 The Park & Sun Sports Tournament 179 Portable Outdoor Volleyball Net System also includes heavy-duty construction but is slightly cheaper. Many things are also slightly smaller. For example, the top tape is 1.5″ and the steel stakes are 8″ compared to the 2″ and 10″ above. 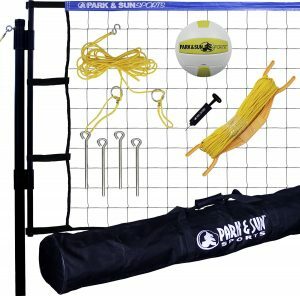 The main difference with the Park & Sun Sports Tournament Flex Portable Outdoor Volleyball Net System is the unique Flex-Net and adjustable torque bar system that evenly distributes net tension. This net system offers quick set up and unlimited height adjustment. 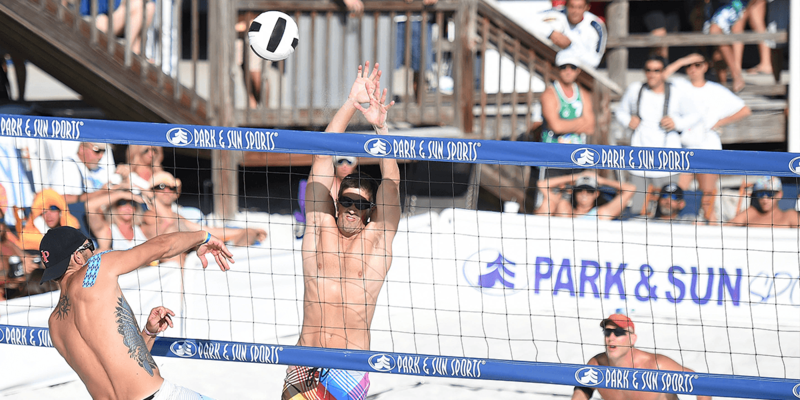 Of all of Park & Sun Sport’s offerings, their Tournament 4000 Permanent Professional Outdoor Volleyball Net System is their toughest net system available. It is also much more expensive than the others and is designed to be set up in a permanent outdoor grass or sand location for professional use. 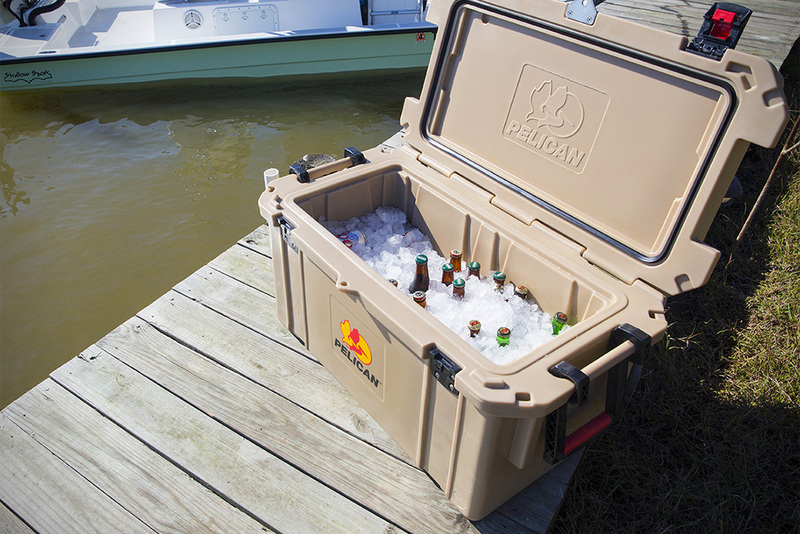 It is not designed for portability, but for high durability and ruggedness. This is a comprehensive volleyball kit with tight fitting pieces and very high quality materials. Once set up, it is highly unlikely you’ll be able to remove the poles for winter. The poles are plated with zinc hardware to resist the elements/rust and the regulation size net is made from 13 oz heavy duty vinyl. The net is also 39″ high for professional competitive play, compared to the 36″ (3′) high nets that most recreation nets have. The top and bottom tapes are also 4″ thick with a coated steel cable running through both the top and bottom. This is a top notch volleyball net system that is expensive but entirely worth it. 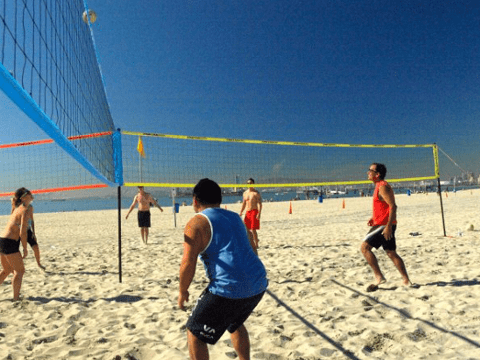 If you’re looking for something a bit different, why not try playing a 3-way volleyball game? 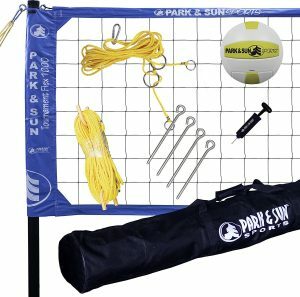 The Park & Sun Tri-Ball Recreational Volleyball Set includes everything you need. This set brings a new dimension to volleyball, allowing 3 teams to play in a very fun and competitive twist on regular volleyball. You need a larger piece of land to play this, but it allows you to add more players and create fun rules for a unique volleyball experience. After a number of years volleyball nets can wear down in the hot sun while the pole system and all your other gear might still be fine. What you need is a replacement volleyball net. Only the net with nothing else coming with it. 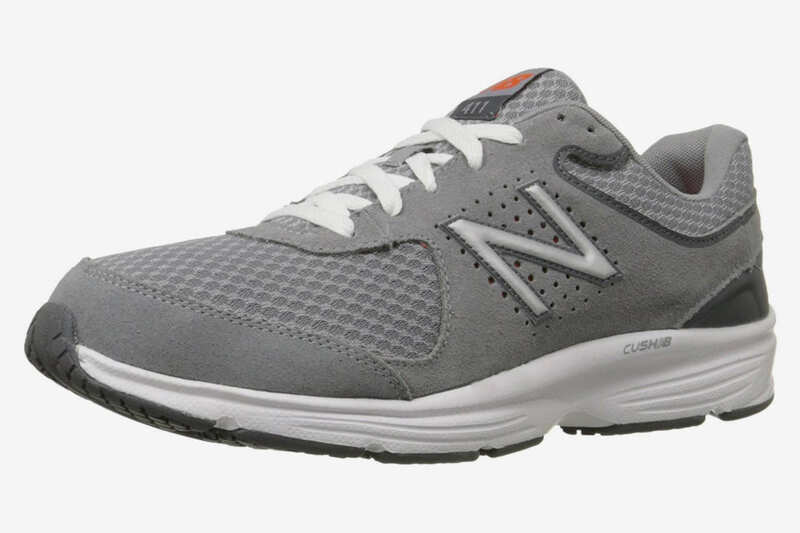 If you already have a way to setup your net, these are perfect for you. Below we have listed the best standalone volleyball nets from the lowest price to the most expensive. 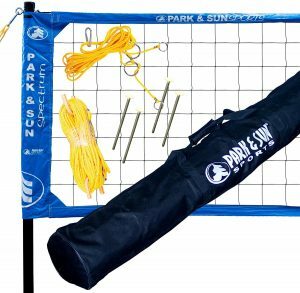 Our first net is the Park & Sun VN2-S Rope Top Volleyball Net. This is a regulation size (3′ x 32′) volleyball net with a 1.5″ top, braided sides and bottom with a nylon cable top. This is a simple and straightforward net that can be used indoors or outdoors. The nylon cord goes through the top edge of the net and can easily be pulled taut. Very reasonably priced for volleyball net of this quality. Our second replacement net is the Park & Sun VN3-S Steel Cable Top Volleyball Net which is very similar to the net above but with a steel cable instead of a nylon cable. This makes it extremely durable and sturdy, especially when someone accidentally hits the net while spiking. The rest of the net is made of nylon and is a regulation size 3′ x 32′. with a 1.5″ orange taped top. Our third net is the Champion Sports Official Olympic Volleyball Net, and it takes a bit of a price jump from the last two. It it a high quality, olympic style power net for professional and tournament play. It uses double rip-resistant 3mm knotless nylon netting and 2.5″ white headband top and bottom for visibility and shape retention. Both the top and bottom have a 38′ vinyl-coated steel cable to keep the net taut and stable, and side pockets with dowels to keep the net’s shape. This is well-made, heavy-duty and sturdy net that should last you many years. 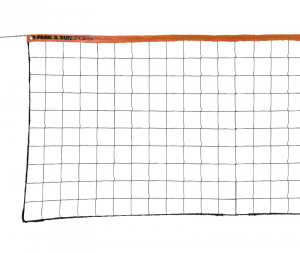 Lastly comes this tank of a net, the Park & Sun BC-400 PRO Volleyball Net. This is a regulation size and professional quality indoor/outdoor steel cable net. 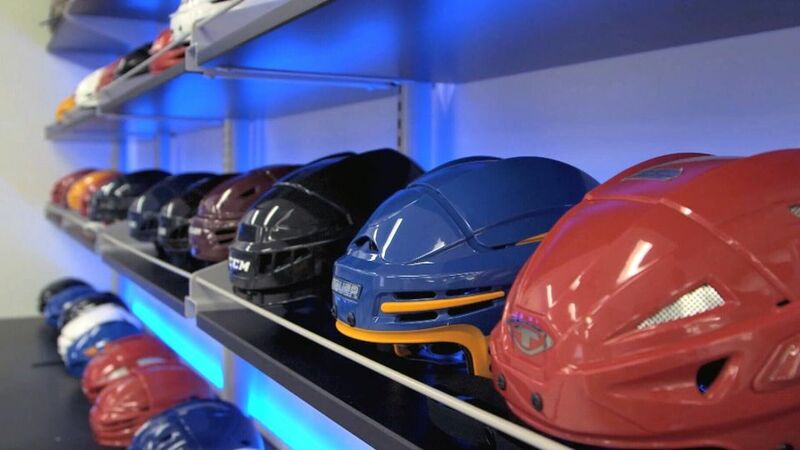 It has a 4″ taped top with 3″ taped sides and bottom to reinforce and protect the net from snapping. The steel cable runs through the top and bottom with 0/8″ wooden dowels to prevent the net from folding and twisting. This is one of the best quality and most durable replacements net you’ll be able to find at a very reasonable price for the quality. The netting holds up very well over many years through wind and rain. Take good care of it and it will last even longer. Forget drawing the volleyball court with your feet in the sand. No more arguing about shots being ‘in’ or ‘out’ and no more using the honor system. Boundary lines help to define your volleyball court whether its on the beach, at the park or in your backyard. What you want is durable, UV-resistant and highly visible rope lines that can quickly be wound up for storage. We recommend the Tandem Sport Rope Volleyball Court Lines for their easy setup, fast storage, lightweight and high quality. They are 1/4″ wide and measure a regulation size 30′ x 60′. These are great for playing beach games and afterwards they can be rolled up using the storage reel. 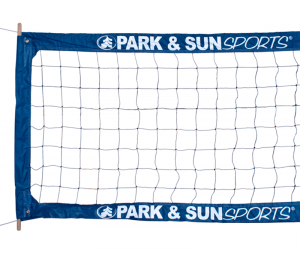 For a thicker boundary line, take a look at the Park & Sun Adjustable Outdoor Volleyball Boundary Webbing. It offers 2″ wide lines and measures 30′ x 60′. You can also easily adjust the lines to match different FIVB court-size standards. 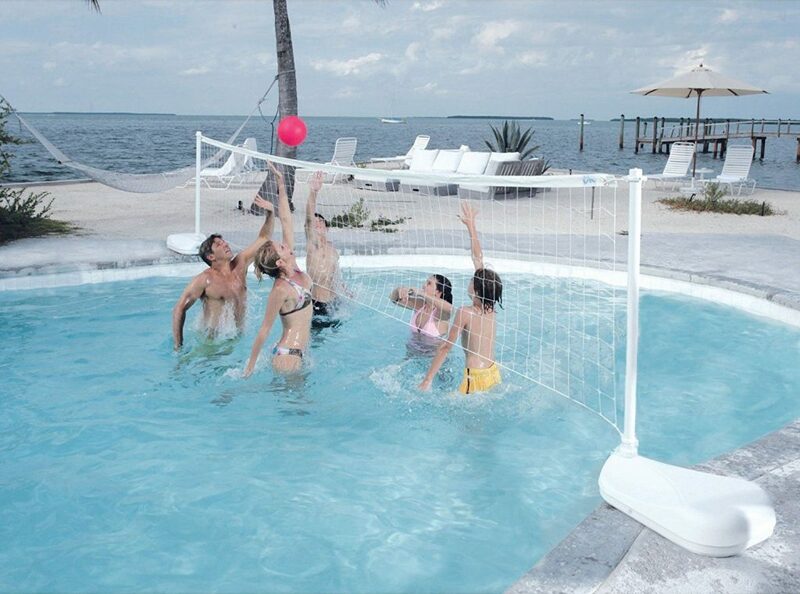 If you want to have some fun volleyball games in the pool, then the best volleyball net for you is the Dunnrite AquaVolly Swimming Pool Volleyball Set. This is a 24 foot long net with fully adjustable height and length to custom fit different pool sizes. It comes with two 1.9 inch thick aluminum posts with plastic bases that can be quickly filled with water to weigh up to 80 pounds. This helps to stabilize the net and prevent it from being knocked into the pool (which can tangle the net) and also withstand high winds. This set also comes with a bright pink volleyball that is fully waterproof. Overall this pool volleyball net system is easy to assemble and will provide you years of fun with your family and friends. Our runner-up for best swimming pool volleyball system is the Park & Sun Sports Portable Indoor/Outdoor Swimming Pool Volleyball Net System. It comes with a 21 foot long net and two 1.6″ PVC poles with bases that can be filled with sand or water. The biggest problem we found is that the poles and bases can still be tipped over even when filled with water. Some people have recommend filling the bases with cement or putting a brick inside it to stabilize it. Other than that, the volleyball net system works well and offers good value, especially if you are not sure how often you’ll be using this. 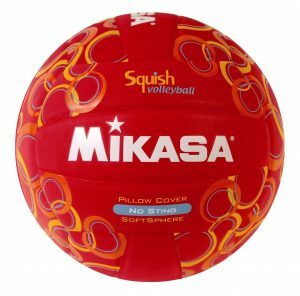 For the best pool volleyball, look no further than the Mikasa Squish No-Sting Pillow Cover Volleyball. 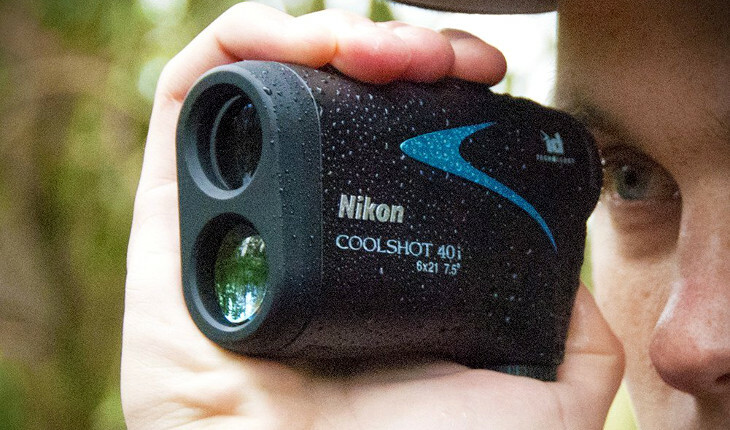 It is completely waterproof and specifically designed to be player friendly with no sting when it hits you. Great for the family and younger players so you can focus on having fun and not worry about hurting your hands, arms or fingers. It’s also perfect for newbies or anyone who doesn’t play volleyball often as it has excellent bounce for easy volleys and a very soft touch.